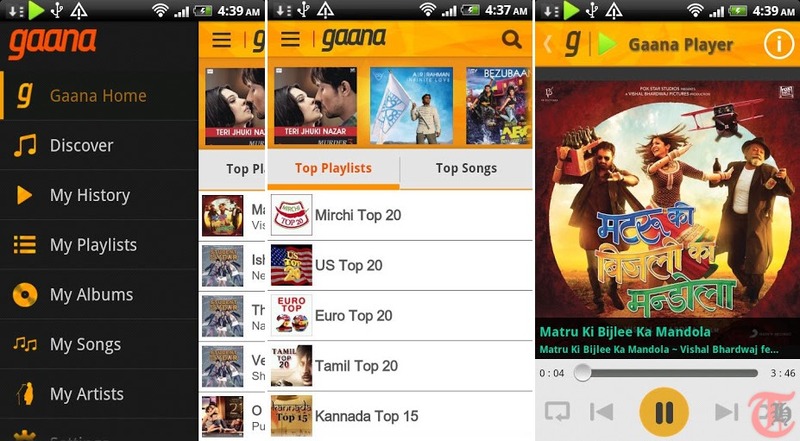 Gaana – one of our favorite Bollywood music source is now available for Android and iPhone. It was one of the few apps to adapt to Windows 8 metro interface and now Gaana for Android and iPhone is available for your pleasure. Gaana offers unlimited Hindi, Bollywood, Tamil and other regional Indian music & radio for free on the web, Desktop and now on smartphones. Check out Most Popular, Radio Mirchi and New Releases section to explore latest music. With Gaana for Android and iPhone, you can listen to the latest and greatest Bollywood songs. Songs in many regional Indian languages including Tamil, Telugu, Punjabi and Marathi are also available through Gaana. No matter where you are, your hearts music is always with you for free. Easily share your favorites with friends on Facebook, Twitter, or by email. During my trial, I did find some bugs though and it was not very smooth. The app crashed several times including phone restart once. It took time to load. However, the collection and the existing playlists come in handy, anytime you wan to listen to latest Bollywood music. I am sure the developers are working hard to resolve issues. I found the UI also a bit boring. It doesn’t seem to follow the holo design guidelines as well. Hopefully we see a better experience soon. The latest Bollywood songs collection is a huge plus in this crowded market of music streaming services. Android and iPhone user interface is not different at all. You get the same experience at least no matter which device you use. To be frank, I liked the Windows Phone app interface. Very clean and works well. I think it takes clues from Windows 8 app. What are your views? Which app do you use to quench your thirst for Bollywood music?